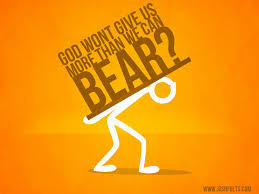 “God won’t give you more than you can handle” is a phrase that everyone has heard, and most have probably used at some point. I have heard different opinions on this in the past, and my personal opinion for the last couple of years has been that God will not give us more than we can handle if we are living for Him and obeying Him. I have known other Christians who have shared my view on it, but most people I know generally throw the phrase around without even thinking much into it at all. Previous Previous post: How To Live The Normal Christian Life.